The aftermath of the deadly Basilan van bombing in July. Police have arrested four men suspected of involvement in the Basilan van bombing that left 11 people dead in July. Authorities have today (Saturday, September 8) identified the suspects as Mike Lijal, Musa Jallaha, Battuh Murah and Haji Hurang Narimin. Police said they voluntarily surrendered and that Lijal and Jallaha admitted being members of the Abu Sayyaf terror group. 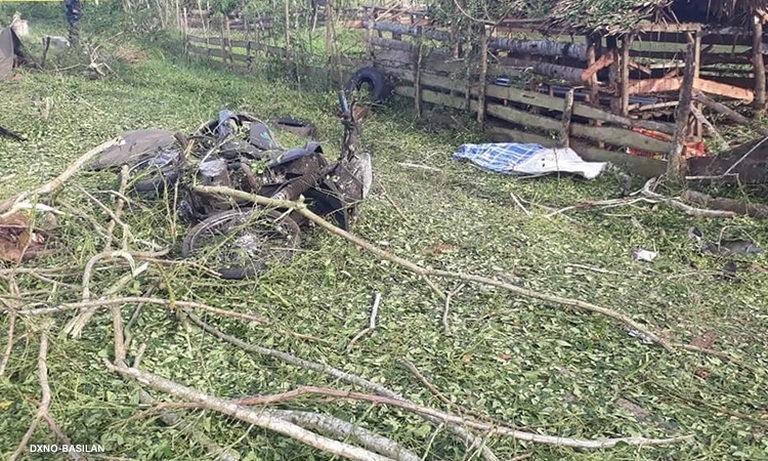 Under questioning, the suspects admitted that the military checkpoint outside the town of Lamitan where the explosion took place was not the intended target. It is now believed that the attacker’s intended target was a nearby gathering of about 3,000 children, but the van stalled at the checkpoint before the explosives detonated. Complaints of multiple murder and multiple frustrated murder have now been filed against the four. Basilan police are continuing to pursue other individuals who have been identified by the suspects. The so-called Islamic State claimed responsibility for the bombing which killed five militiamen, a soldier and four civilians, including a mother and child. A statement issued by the terror group called it a “martyrdom operation”. Just hours after the attack on July 31, police arrested Islamic cleric Indalin Jainul, alias Ustadz Abdulgani. Informants told the army that the cleric, aged 58, knew the bomb would go off and had been helping foreign operatives reach the island from Malaysia. A grenade was found during a search of his home. Then, a Twitter user called ‘TerrorMonitor’ shared a photo of a Moroccan man called Abu Kathir al-Maghribi, whose face matched eyewitness’ accounts of the van driver. The same picture was shared by an account linked to IS. IS-affiliated Abu Sayyaf, which was founded in the late 1980s in Basilan, has been blacklisted by the US and the Philippines for bombings, kidnappings for ransom and beheadings. It has been weakened by government offensives but remains a serious security threat. Read more about the terror group here. Give them a fair trial, then kill them.